We understand you may be anxious about coming to stay at Rossie but we are passionate about caring for you and supporting you through your time here. We hope you find the information below useful for easing your journey. Staff will spend time with you so you get to know each other, and to help you settle into your new surroundings. Care staff will have conversations with you about everything you need to know about living with us – like what the daily routines are, and what the expectations are from you and staff. We really take the time to get to know you, what you like or do not like, and how you prefer to be cared for. At this point, you will meet your Specialist Interventions Services (SIS) Worker, the SIS manager and the Nurse. We carry out a number of assessments so that we can provide the best care possible to you. Staff will explain what is involved in the assessments – do not worry, they are not difficult. Within 3 days of you coming to live in Rossie, you will have met the staff who will do the assessments with you. Our Nurse will meet you to get to know about your health and if you are on any medication. Our Nurse will register you with the local doctor, dentist and optician if needed. We want to know all we can about your medical needs, so that we can include this in your care plan. 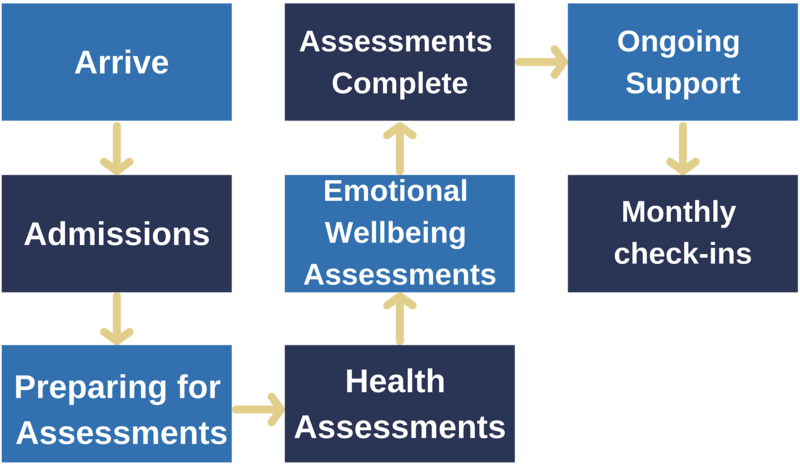 This assessment is step one for building up your personalised care plan, and focuses on your mental wellbeing. You may have heard the word ‘Interventions’. This is a plan for how we can help you feel better emotionally and help you deal with any anger or upset you may be feeling. We do this through our ‘Interventions Pathway’ which we developed for all young people at Rossie. Within three weeks, all your assessments will be completed. We keep all information about you together in one place so we can get it out when we need it during meetings with you. After the assessments are completed, you will meet with your SIS worker weekly to talk about progress. You will have routine checks with the nurse, dentist optician if required so you stay in good health. All of our young people can visit our medical room at Rossie, and our Nurse opens the clinic every Monday to Friday. She will assess and treat any minor illness or injuries you may have – she also listens to any worries you may have. If you are living in any of the residential houses, you will be encouraged to use the community help services. Staff will help and guide you through this. Your SIS worker as well as meeting with you weekly, will also check-in with you every month to see if you need any additional mental well-being support. This makes sure you are getting the best help possible.